Have you started to notice that your dog’s fur is turning white or gray? While it can be shocking to suddenly realize your pet’s fur has changed color, there might not be anything wrong with your beloved dog. AVES is here to tell you about the reasons your dog’s fur might be turning a white or gray color. Age is one of the most common reasons for pets going gray. This is a very similar process to the one we see in humans as we age. However, unlike humans, dogs don’t tend to go gray throughout their entire coat. The majority of graying will happen around the muzzle and face. Graying usually starts with a salt-and-pepper look in dogs. Dogs that are naturally gray can also show signs of aging, but you might have a more difficult time spotting these changes. Generally, coat texture changes with age, so you might start to notice that the texture of your dog’s fur is different than it used to be. Also, gray dogs might start to turn more white than gray as they age. Stress and anxiety could also be potential causes for your dog’s hair turning white. While the reason is unknown, it is possible that stress somehow causes the body to stop producing pigment in the same manner as it used to. If you are unsure of whether or not stress or anxiety are causing problems for your pet, you can speak to your veterinarian or a veterinary behaviorist to what you can do to reduce the stress in your dog’s life. If it seems like your dog isn’t old enough to start graying, you might find it interesting that genetics can play a role in when your dog’s hair starts to turn white. Do you have a friend that started graying before 30? Think of your dog in the same way. Even perfectly healthy dogs might be genetically predisposed to early graying. In fact, even puppies can have graying hair, and it can start to become more silvery with age. A few breeds are more likely to be genetically predisposed to graying. Schnauzers are known for their gray beards, while greyhounds and Weimaraners are naturally gray in color. It is also common for black dogs to start showing gray earlier than lighter colored dogs. Sometimes, the reason your dog’s fur is turning white is a condition call vitiligo. Vitiligo is a rare skin condition that can cause pigment loss in certain patches of skin and fur. While the causes of vitiligo are unknown, many scientists believe that the condition is hereditary. However, it is clear that vitiligo occurs when something happens to the melanin-producing cells in your dog’s body. Vitiligo affects all dogs a little differently. Some dogs will lose pigmentation on their entire body, while others will only be affected in certain spots. Depigmentation can also spread over the first few months of the condition’s appearance. Vitiligo can also cause skin lesions and dandruff. Fortunately, all of the symptoms of vitiligo are painless for your pooch. Vitiligo is also more common in purebred dogs due to the hereditary nature of the condition. There are a few health issues that might cause your dog to start graying. One of these conditions is hypothyroidism. Dogs with hypothyroidism have underperforming thyroid glands. Hypothyroidism also causes a variety of other symptoms including weight gain and skin problems. 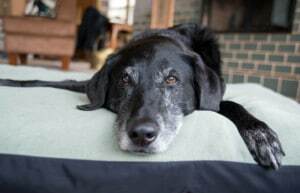 Getting your dog proper treatment for hypothyroidism should reverse the graying of the fur. Liver and kidney disease can also cause graying. However, this is a very rare symptom of these diseases. The reason that these diseases lead to graying fur is that the toxins aren’t being removed from the body quickly enough. Treating the underlying condition can reverse the graying. If your pet appears to be graying prematurely, bring them in for a visit with your veterinarian. If liver or kidney disease or hypothyroidism are determined to be the cause of the premature graying, your veterinarian may want to refer you to a specialist. For those living in Austin, Texas, you can request a referral to AVES, where you will meet with our team of specialists. Our internal medicine team can meet with you and come up with an appropriate course of treatment for your pet.